Whether you sell printing services to businesses or printed products to consumers, the right web- to-print software can make the buying process much more convenient for your customers. Online ordering can also bring more consistency and control to your day-to-day operations. As people grow more comfortable ordering products from online retailers, they will expect to be able to do so with online businesses, too. According to B2B e-commerce was a $889 billion marketplace in 2017. It is expected to reach $1.1 trillion in 2019. Today, many start-up businesses regard e-commerce as an integral part of their operations. For example, the Shopify e-commerce platform has enabled hundreds of thousands of entrepreneurs and small-businesses to open online stores. On Black Friday and Cyber Monday, Shopify merchants processed over $1 billion in gross merchandise volume. Some of this business was routed to print service providers through Shopify apps such as Printful and Printify. The first web-to-print systems were designed primarily to handle small-format documents such as business cards, stationery, postcards and sell sheets. A lot has changed since then. Today, print software developers are building online storefronts for the huge variety of products that can be digitally customized and printed on demand. Whether you print signs, banners, labels, packaging, promotional products, photo gifts, T-shirts, wallpaper, fabrics or displays, you can find systems that help you sell some of your products online. You can get ready-to-use systems or software recommendations from your printing equipment and RIP vendors. Or, you can choose to work with one of the dozens of independent software companies that sell web-to-print solutions either for on-site use or through the cloud. Another option is to hire your own development team to create a system that works exclusively for your company and customers. The term "web-to-print" typically refers to various combinations of self- service estimating, design, ordering, file submission, proofing and online payment capabilities. Some solutions are integrated with print management functions such as order management, job planning, customer relationship management, invoicing and shipping. Web-to-print systems also vary in terms of the types of products that can be designed or ordered online. Newer systems enable users to customize templates for both printed materials and online marketing. Salesforce, Slack, Stripe and other popular programs. Software developed by large- format equipment manufacturers and RIP vendors are designed to integrate seamlessly with the prepress software for digital presses and large-format printers. The first companies to adopt web-to-print ordering systems were multi-million-dollar commercial printing businesses that needed to cope with a rising volume of shorter-run orders from a variety of customers. Many of these systems required tens of thousands of dollars upfront. Today, subscription-based software-as- a-service (SaaS) solutions make it possible for small- to medium-sized printing businesses to offer online ordering without upfront investments in hardware, software or IT staff. For a monthly fee, you receive access to the software, online storage, upgrades and tech support. The fee varies on how many users and storefronts you will have and how much storage and tech support you need. Subscription-based solutions update each time different browsers are updated. Plus, the software developers are constantly striving to make their solutions faster to learn and easier to use. One company that will be using a cloud-based system is Mandel Graphic Solutions in Milwaukee, Wisconsin. They are working with PressCentric. Company President Rick Mandel chose PressCentric because they were willing to work with him to build templates for the unique requirements of large-format printing. Another factor for Mandel was the requirement of some web-to-print software programs that customers use the built-in design tools. "My clients don't want to do that," he said, reaffirming the preference of large-format graphic designers to create within Adobe Photoshop, InDesign or Illustrator, then save/export in a format that works best for the application (PDF, EPS, etc.). 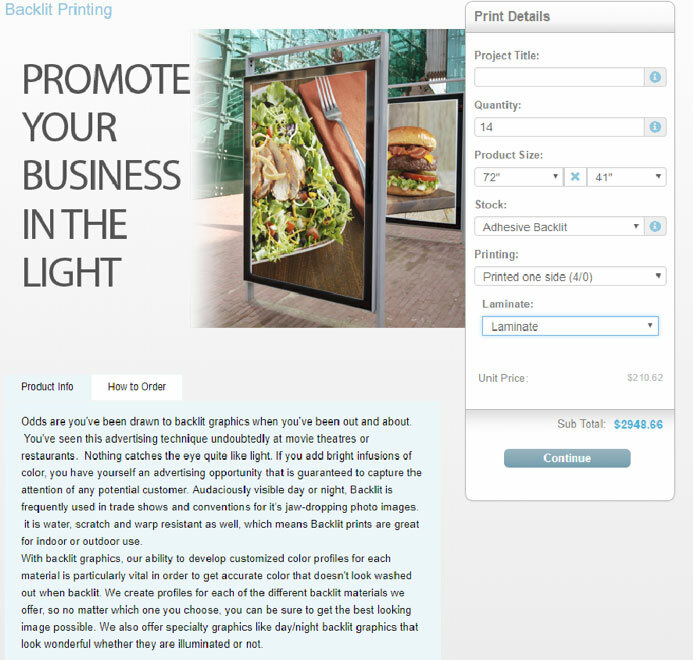 Mandel's web-to-print portal will include a mix of static and dynamic storefronts. The static storefronts will enable customers to buy specific prints or hardware. In the dynamic storefronts, some designers will choose to apply their own images to templates for products such as banners, posters, window decals and retractable fabric banners. Other clients will be able to use PressCentric's design tools to design their own graphics within the portal. Although there are many advantages to working with a cloud-based system, there are some potential drawbacks, too. Some potential downsides of working with subscription-based companies include lack of flexibility and the use of a third party's server. "If you are building files within their portal and servers, the speed will always be slower than working on your own desktop," said Mandel. "So, ideally the template files are built with an Adobe program, then converted to the portal format within the SaaS environment." Issues to consider when researching SaaS options include: the administrative tools (back office) for estimating and planning; the software to create templates and storefronts; the ease of use for the customers; uninterrupted access to critical job data; and the responsiveness of tech support. Some level of customization might also be needed. When it comes to adding features that better match your business model, a smaller web-to-print development team may be more flexible than the more established web-to-print providers. The smaller companies value each customer and work hard to keep them. As web-to-print development companies grow larger, they reach a point when they can't afford to spend much time tweaking their core products for each printing company they serve. They must focus on generating revenues that will recoup the high costs associated with developing their existing products. Some buyers of cloud-based web-to- print systems still worry about losing access to job data if their internet connection is interrupted. But internet services are becoming faster and more reliable to support the ongoing expansion of the Internet of Things. If your internet connection goes down temporarily, you should still be able to access critical business data through the wireless service on your phone or tablet. Before subscribing to a web-to-print service, ask how technical support is provided. If you are experiencing technical glitches with your storefronts, you don't want to have to fill out a form and wait for an email reply. Some smaller web-to-print service providers will give you a direct phone contact number and even emergency phone numbers, so you can resolve your issues quickly. Also ask the software provider how often the system is updated. The look, feel and speed of the software can help you discern if the vendor updates the system. B2B e-commerce is complicated by factors such as contract pricing, more detailed job specifications and the need to deal with multiple destinations for shipping and billing. In the world of large-format graphics, many jobs involve services beyond printing and finishing. So even though there are dozens of vendors of web-to-print software, don't be surprised if you can't find a system that fills all your shop's needs. If you handle projects that involve large numbers of graphic files and complicated logistics, you might have to consider some level of customization. That's the route that Image Options took. Image Options in Foothill Ranch, California, designs, engineers, produces and delivers graphics and displays for retail and marketing communications and events. Over the past four years, they have invested a lot of money to develop an online suite of products called IO-View. It combines project management, production asset management, collaborative work, file transfer and web-to-print capabilities. Some of Image Options' biggest customers are using IO-View to manage and organize their own increasingly complicated workflows. According to Image Options' President Brian Hite, the IO-View platform originated after they landed a big, multi-piece project that involved more than 2,000 different graphic files. Employees from the client's team were dropping files into emails or uploading them to an FTP site. Sometimes Image Options would get an instructional Excel spreadsheet in the morning and then a revised spreadsheet in the afternoon, without any clear indications of which line items in the file had been changed. To help bring order to the chaos, the programming team on the IO staff developed software to manage the project through a database. The database enabled them to quickly identify new or modified items without relying on the spreadsheets. After developing this software for internal use, Image Options showed other clients how the software could help them be more efficient in managing complex projects. "We provided a one-stop, SaaS web-based tool through which they could define the parameters of the project, upload all of the assets for the project, develop PDFs of all files and route them through all of the phases of the approval process," explained Hite. "We also allowed them to grant other print vendors access to the system as needed." So, if a marketing or retailing graphics project required some components to be printed on litho or screen printing presses, the screen printing firms and litho companies could have access to the files that were appropriate for those jobs. Over time, new features have been added to the IO-View software suite. It now includes a full-blown project management system. In addition to storing job data, such as type and size of the graphic and the type of print media to be used, IO-View includes milestones for completion. If a production manager has a question about a certain file or job within the system, they can send an email and PDF directly to the designer or project manager. The recipient can open the email, view the PDF and resolve the issue without having to exit IO-View or open another application. With the events version of IO-View, expo managers can track all the signage and graphics that need to be produced for a major convention, including the scheduled dates for installation and takedown. IO-View software is used to coordinate event graphics for one of the largest user- group meetings in the United States. This conference in San Francisco attracts more than 170,000 attendees and requires printing, installing and removing more than 4,000 signs and graphics at multiple conference centers, hotels and event sites. A key benefit of IO-View is that every member of the project team can see which graphics are currently being designed, printed, installed or delivered. Being able to see what percentage of big projects have been completed can be immensely helpful to the production team," said Hite. "In the old days, you didn't know how much work was coming your way until it arrived. Then it was one of those 'Oh crap!' moments when you realized how much you would have to get done." Retail clients who want to order packages of graphics for specific store locations can use the web-to-print component of IO-View. 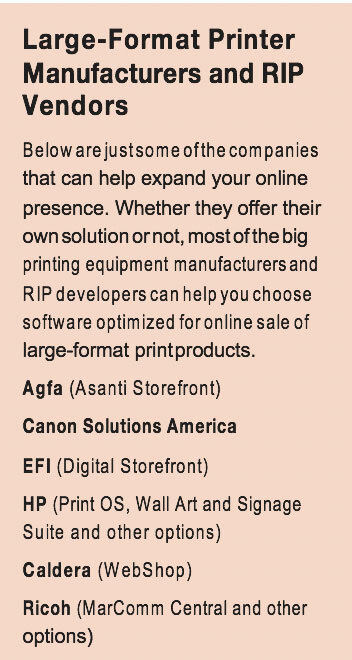 The web-to-print capabilities are powered by EFI's Digital Storefront. Buyers can view a gallery of graphics used in a specific retail campaign, select the types and sizes of graphics they need for their store and route their order for approval before submitting it. If a package of retail or event graphics gets damaged during shipping, Image Options can quickly send reprinted graphics. With IO-View, Image Options knows exactly which graphics were shipped in each package. Hite said the IO-View platform suite is overkill for clients who only order a few graphics at a time. But clients who produce 50, 100, 1,000 or 10,000 files a month can use IO-View to reduce their labor costs. One IO-View user reduced its graphics project management staff from 30 employees to nine. Clients who use Image Options' IO- View suite subscribe through monthly fees for software licensing, service, support and customization of their workflows. If you think a customized system is the only option for your shop, Hite said the development costs can be significant. He advised looking around to see what's already available on the market, then defining what else you think you might need. When you create a scope of work and send it out for estimates, you'll see that custom coding becomes expensive very quickly. The developer of a cloud-based web- to-print software service agreed that customization is costly: "If you are lucky and don't live in a very competitive market such as New York, San Francisco or Los Angeles, you can easily pay $100,000 to hire one full-time developer." Plus, your developer must spend a lot of time on research and development to keep up with changes that can affect your system. Rock LaManna visits dozens of print companies annually as he helps connect business owners with potential buyers of their companies. He said many companies are currently going through the process of establishing web-to-print storefronts and more automated processes. "The major stumbling block isn't the cost of the software, but the amount of time and effort associated with customizing features and integrating different types of software," said LaManna. "Migrating existing business operations and customers to the new system can also be tricky and time-consuming." For some companies, the process of getting a system up and running can take up to five years. Even so, if you plan to sell your printing business in the foreseeable future, LaManna said it's wise to have a web-to-print solution in place. Otherwise, the potential buyer of your business will immediately discount the value of your business. The new owners won't want to spend years getting a system up and running. One way to boost the value of your printing business in the eyes of investors is to have a web-to-print system installed and perfected. LaManna also advised appointing a full-time employee to champion and implement your program. Relying on the software developer to implement your program can slow down the process, because they have other customers they must serve as well. As a print service provider, you aren't the only company struggling to keep track of thousands of different digital files and different types of workflows. Brands, retailers, event organizers and marketing agencies face challenges related to brand consistency and timeliness when dealing with multiple files, vendors, invoices and shipments. The full-featured marketing resource management program from BlueSky ETO includes a web-to-print module for distributed marketing teams. The BlueSky website notes that: "Many businesses adopt web-to-print systems from their print vendors. When they do, they sacrifice the ability to integrate all of their marketing collateral and vendors into one system." Propago's web-to-print portals for brands and marketing agencies enable users to order, personalize, produce and distribute marketing communications materials from multiple vendors. All the marketing materials and promotional products available through the online storefronts comply with brand standards and regulatory requirements. 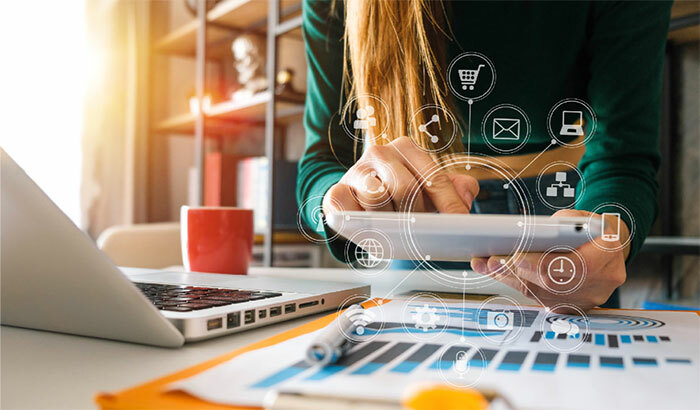 Last May, Esko and Media Beacon announced an integrated platform to enable brands to be more efficient and consistent in delivering content across digital and physical marketing channels, including packaging. Some print service providers have positioned themselves as print-on-demand and drop- shipping centers for online retailers who want to sell customized or personalized products. They support e-commerce experts such as Shopify and Pixels.com. Shopify is a cloud-based, multi-channel commerce platform for small and medium-sized businesses. Merchants use the software to design, set up and manage their stores across multiple sales channels, including web, mobile, social media, marketplace, brick-and-mortar locations and pop-up shops. Shopify currently powers more than 500,000 businesses in 175 countries. Shopify was launched in 2006 by Tobias Lutke, Daniel Weinand and Scott Lake after they attempted to open an online store for snowboarding equipment. With Shopify's Application Programming Interface (API), developers can create apps that Shopify merchants can use to improve the operations of their online stores. One app was created by Printful, an online print production and fulfilment center. When Shopify merchants use the app, orders for customized T-shirts, posters and other selected products are sent directly to Printful for printing and shipment. The Printify app enables Shopify merchants to sell more than 200 products that can be printed and shipped on demand. The orders are sent to a network of print service providers who produce and ship the selected products. Pixels.com started in 2006 as Fine Art America. Self-taught programmer Sean Broihier set it up as a marketplace through which living artists could sell their original art and prints to consumers around the world. Today, Pixels.com enables independent artists to sell dozens of print- on-demand products, including canvas prints, acrylic prints, metal prints, framed prints, greeting cards, beach towels, tote bags, phone cases, shower curtains, pillows, duvet covers, yoga mats and apparel. To fulfill orders for these printed products, Pixels.com contracts with 14 print production facilities in five countries that have enough digital printing and finishing capacity to consistently provide the fast delivery that consumers now expect. Unlike online art stores that pay royalties for licensed artwork, Pixels.com enables artists, illustrators and designers to set their own prices. When these creative professionals select which products can be decorated with their images, they see the basic production price for that product. Individual artists set the final selling prices. A beginning artist might add a $20 markup, whereas a well-known illustrator could add $100, $200 or more. Broihier continually updates the e-commerce technology in Pixels.com to make it easier for the artists to market their products through emails, newsletters and social media. He also supports artists who set up their own Shopify stores and enables artists to capitalize on emerging revenue streams such as licensing images for streaming in a large-format digital art frame from LG. More than 100,000 living artists and photographers offer more than 10 million images for sale on Pixels.com. As marketing, manufacturing and e-commerce technologies continue to advance, the term "web-to-print" is starting to sound outdated. So what should we call it? Major changes are underway in how all new products are discovered, ordered and produced. To attract more business from start-up companies, millennial entrepreneurs and marketing teams of all types and sizes, you must have systems in place to accept and process online orders. Don't be discouraged if you can't find the perfect solution. And don't allow yourself to get overwhelmed by all the current options. You may need to develop a hybrid solution. Start with a web-to-print solution that meets most of your needs and plan to customize other elements. Whether you hire your own IT people or rely on outside developers to provide the functionality you need, treat them with respect. And listen to their advice. Part of their job is to keep up with constant changes in print production and marketing automation technology, cybersecurity, cloud computing, storage technologies, online payments and everything else that goes into keeping a web-to-print platform current. Considering how much time is involved in launching your web-to-print services, you can't risk getting stuck with a system that can't grow and evolve with the needs of your customers. Eileen Fritsch is a freelance writer based in Cincinnati, Ohio. She has covered the evolution of large-format digital printing since the 1990s, when she was assistant editor of Screen Printing magazine. She was a founding editor of Big Picture magazine for ST Media Group and Great Output magazine for the Professional Digital Imaging Association. In recent years, she has written articles about various applications and markets for digital printing, including textiles, garments, interior decor, glass decorating, retailing, professional photography, art and packaging. Contact her at eileen@eileenfritsch.com.